SEATTLE--(BUSINESS WIRE)--Sep. 17, 2015-- (NASDAQ: AMZN)—Amazon today introduced all-new Fire HD tablets, designed from the ground up for entertainment with a stunning 8” or 10.1” widescreen HD display, an incredibly thin and light design, quad-core processor, stereo speakers with Dolby Audio, front- and rear-facing cameras, and microSD card support providing up to 128GB of expandable storage. Fire HD also introduces Fire OS 5 “Bellini,” which brings the best entertainment experience on any tablet, with an updated user interface, deep integration of Amazon-exclusive services, and hundreds of new and upgraded features and platform updates. With its 8” display, Fire HD 8 is the perfect tablet for web browsing, reading, or gaming. It is available in four color options: black, magenta, blue, and tangerine, and offers an incredible value at only $149.99. Fire HD 10 is Amazon’s largest tablet yet, with a 10.1” display that is perfect for widescreen entertainment. Available in two color options, black and white, it’s only $229.99. Fire HD tablets start shipping September 30. Thin and light industrial design—at 7.7mm, Amazon’s thinnest tablets ever. Crisp and vivid HD display with over 1 million pixels; with a 16:10 widescreen aspect ratio, Fire HD 8 offers 15% more HD video viewing area and Fire HD 10 offers 22% more HD video viewing area than similarly-sized tablets with a 4:3 aspect ratio. Powerful quad-core processor running at up to 1.5 GHz for fast app switching and fluidity. As measured in tumble tests, Fire HD is almost 2x more durable than the latest generation iPad Air. Stereo speakers with Dolby Audio, which are custom-tuned for immersive, high-quality sound. Powered by the latest version of Fire OS—Fire OS 5 “Bellini”—with an updated user interface that is inspired by the beautiful layouts of high-quality magazines, making it fun to browse for your next movie, song, or book, or easy to pick up where you left off. Plus, Fire OS 5 includes hundreds of new and upgraded features, platform updates, and Amazon-exclusive services. First tablet with Amazon Underground, a one-of-a-kind app store experience where over $10,000 in apps, games, and even in-app items are actually free—including extra lives, unlocked levels, unlimited add-on packs, and more. Have you ever forgotten to download a movie ahead of a flight? For Prime members, On Deck automatically keeps your Fire tablet current with popular Prime movies and TV shows, as well as Amazon Original Series, so you always have something good to watch. Importantly, On Deck only uses the available storage on your tablet, opportunistically in a special shadow mode. When you download something, On Deck automatically makes room for your selected content—there’s no hassle of needing to clear out space yourself. The best reading experience on a tablet gets even better with Word Runner, a new feature designed to help you read faster—one word at a time—by bringing each word to the center of the screen to where your eyes are already focused. Word Runner gradually builds to your preferred reading speed, then algorithmically and automatically slows down for difficult words, punctuation, and paragraph breaks. Access to over 38 million movies, TV shows, songs, books, magazines, Android apps and games, and more—with free, unlimited cloud storage for all Amazon content. Amazon-exclusive features customers love, including ASAP, X-Ray, Second Screen, Family Library, Amazon FreeTime, Prime Video downloads, and more. Video chat with friends and family with the 720p front-facing camera; take photos and capture videos in 1080p full HD with the 5MP rear-facing camera. Free, unlimited cloud storage for all photos taken on Fire devices, automatically backed-up wirelessly. All-day battery life delivers up to 8 hours of reading, browsing the web, listening to music, and watching video. Amazon’s thinnest tablets ever at 7.7mm, the new Fire HD tablets are incredibly light—in fact, at 432 grams, Fire HD 10 is lighter than iPad Air—making them easy to hold for hours so you can watch movies, read books, and play games comfortably. Constructed using fully laminated HD IPS displays with over 1 million pixels, Fire HD offers vivid image quality with less glare, high luminance, and wide viewing angles. Fire HD 8’s widescreen 16:10 aspect ratio also offers 15% more HD video viewing area than the new iPad mini 4; Fire HD 10 offers 22% more HD video viewing area than the latest generation iPad Air. This means that rather than shrinking a movie to fit the screen, Fire HD presents a widescreen image so you can enjoy the full picture—as it was intended, without compromise. Fire HD is powered by a MediaTek quad-core processor running at up to 1.5GHz—resulting in a fast and fluid UI, and HD videos and high frame-rate games that run smoothly. With a Gorilla Glass display and a design that is engineered for best-in-class durability, you don’t have to worry about Fire HD breaking. In fact, as measured in lab tumble tests, Fire HD is almost 2x more durable than the latest generation iPad Air. Fire HD is custom-tuned for immersive, high quality sound—it features two stereo speakers with Dolby Audio, including 5.1 virtual surround sound so that you can listen to videos or music at full volume and still hear crisp, clean sound. Fire HD now offers expandable storage via a microSD card slot for up to 128GB of additional storage, so you can access even more content, including apps, movies, music, and photos while offline. When combined with free, unlimited cloud storage for Amazon content and for your personal photos taken with Fire devices, you’ll never be without a favorite movie, game, or photo album. Fire HD offers a new protective cover available in six colors that can stand in both portrait and landscape orientations, starting at $39.99. Also available for Fire HD 10 is a protective Bluetooth keyboard case that stands in three angles and is designed to provide a natural typing experience with full-sized keys, an integrated track pad, and shortcut keys that provide single-click access to email, media controls, and volume. The Fire HD 10 Keyboard Case is $99.99 and is available for pre-order at www.amazon.com/Fire-HD-Keyboard. Fire HD is powered by the newest version of Fire OS—Fire OS 5 “Bellini”—which introduces hundreds of new and updated features. Fire OS starts with Android Lollipop, and improves upon it by deeply integrating Amazon’s hardware, platform, software, content, and cloud. For developers, if an app runs on Android, it can run on Fire OS with little to no work. Fire OS 5 “Bellini” introduces an updated user interface that provides the best entertainment experience on a tablet, making it easy to access your favorite apps or discover new content. The new home screen includes dedicated content pages for books, games and apps, video, music, audiobooks, and periodicals—each page presents an engaging layout akin to the beautiful pages of a magazine and presents your recent content as well as personalized suggestions for new entertainment. If you subscribe to services like Prime, Kindle Unlimited, or Audible, you can easily discover new content that you can access at no additional cost. Many apps and games that are marked as “free” turn out not to be completely free. They use in-app payments to charge you for special items or to unlock features or levels. Fire HD tablet owners have access to a one-of-a-kind app store experience where over $10,000 in apps, games, and even in-app items are actually free. Experience titles from top developers, including Disney, Rovio Entertainment, Gameloft, Zeptolab, and Sega of America without ever having to pay for the app or in-app purchases. Fire HD offers a crisp HD display, Amazon-exclusive features like the Bookerly reading font and Immersion Reading for audiobooks, and innovative new reading enhancements being introduced with Fire OS 5 “Bellini.” Read Faster—one word at a time—with Word Runner, a new speed reading feature that brings each word to the center of the screen to where your eyes are already focused. Word Runner has Dynamic Pacing so it gradually builds to your preferred reading speed and algorithmically and automatically slows down for difficult words, punctuation, and paragraph breaks. If you miss something, just tap and hold the screen to activate the brake, which instantly pauses Word Runner and lets you easily scroll back and pick up wherever you’d like. See a video: www.amazon.com/wordrunner. Family Library now allows families in an Amazon Household to share Prime benefits, including Prime Video, Kindle Owners’ Lending Library, free 2-day shipping on millions of items, and many other benefits. Family Library links your Amazon account to that of your spouse or partner so you can easily share apps, games, audiobooks, books, and Prime Video content within your household without changing accounts. Family Library lets family members share their content while using a single Fire tablet with different profiles, or across multiple devices—including Kindle e-readers, Fire tablets, and Amazon Fire TV—as well as on all of the other most popular devices and platforms with the free Kindle, Audible, and Amazon Video apps. Mayday revolutionized customer service with video chat on Fire HDX. Mayday Screen Sharing now brings Mayday-powered tech support to Fire HD tablets, delivering 24x7, 365 days a year technical assistance—for free. When you call in to customer service by phone, the Amazon expert can share your screen—with your permission—to draw on your screen, talk you through how to do a task, or to do it for you. The new Fire HD user interface is perfect for helping Prime members discover the best selection of digital content—available at no additional cost. Prime Video provides streaming access to tens of thousands of movies and TV episodes, including Entourage, Orphan Black, and Downton Abbey, and is the only U.S. online subscription service that enables offline viewing. Plus, get access to award-winning Amazon Original programming like Transparent and Tumble Leaf, as well as new shows coming this fall. With Prime Music, you can listen ad-free to over a million songs, and with the Kindle Owners’ Lending Library, you can choose one book per month from more than 800,000 books to borrow for free with no due dates, including current and former best sellers. Included with Prime, you will also receive secure unlimited photo storage in Amazon Cloud Drive for your entire photo collection. Over 300,000 apps and games in the Amazon Appstore, including the most popular titles like Facebook, Netflix, iHeartRadio, Twitter, Angry Birds Stella, Minecraft: Pocket Edition, and more. Amazon Video offers hundreds of thousands of titles to buy or rent, including new release movies such as The Divergent Series: Insurgent, The Longest Ride and Hot Pursuit, or the latest TV programming like The Astronaut Wives Club, Pretty Little Liars, How to Get Away With Murder, and many more. Millions of songs are available with Amazon Music and purchases are stored for free in the cloud for access anytime, anywhere. Millions of books, including hundreds of thousands of titles that are exclusive to the Kindle Store. Over a million titles are $2.99 or less, over two million are $9.99 or less. With Kindle Unlimited, enjoy unlimited reading of over 1 million books including Diary of a Wimpy Kid, the Wayward Pines trilogy, and the entire Harry Potter series, and unlimited listening to a selection of thousands of audiobooks for just $9.99 a month. Over 180,000 professionally-narrated audiobook titles from Audible, with free samples to listen to before buying. Amazon FreeTime Unlimited offers more than 10,000 books, videos, and educational apps and games that have been curated for age-appropriateness for kids—starting at $2.99 per month. Now you can watch the big game, breaking news, and more live with a subscription to Sling TV—which includes channels such as ESPN, CNN, TBS, HGTV, AMC, and more. Plus with apps like HBO NOW and SHOWTIME, customers no longer need a cable subscription to access their favorite TV shows and movies on Fire tablets. Instant streaming with ASAP—No more waiting for movies and TV shows to buffer. ASAP (Advanced Streaming and Prediction) predicts which Amazon movies and TV episodes you want to watch and has them ready for you before you even hit play, so videos start instantly. Easily find out who that actor is—X-Ray for Movies and TV Shows is available directly on Fire HD—simply tap the display and get instant access to actor biographies in the scene, trivia, soundtracks, and more on tens of thousands of movies and TV episodes. X-Ray for Movies and TV Shows is exclusive to Amazon Video and powered by IMDb—the #1 movie website in the world. Simple to set-up and easy to use—Arrives pre-registered so you can simply turn it on and start enjoying your entertainment within minutes. Screen sharing—Tap the “fling” icon on your Fire tablet to send video and audio to your compatible big-screen TV using Second Screen. Personal photos and videos—Play slideshows and choose a favorite album for your home screen image. Photos or videos you take via phone or tablet can be automatically uploaded to Amazon Cloud Drive, making them accessible on all of your Fire devices, and on compatible iOS and Android devices. Whispersync—Amazon’s Whispersync technology saves and synchronizes your Amazon video, book, and music library across all Amazon devices. Start watching a movie on an iPhone or a Fire tablet, and pick up where you left off on Amazon Fire TV. Enjoy on hundreds of devices—Buy a movie, TV show, book, or song on Amazon once, and enjoy it everywhere—on hundreds of devices, including iOS, Android, and Fire OS devices. Amazon FreeTime—Available exclusively on Amazon devices, FreeTime provides innovative parental controls that encourage learning before play and that help manage screen time. Free month of Amazon Prime—Amazon continues to invest in bringing Prime members new movies, TV shows, songs, and books to enjoy at no additional cost. Prime members enjoy unlimited, commercial-free, instant streaming of thousands of movies and TV episodes with Prime Video, and unlimited photo storage in Amazon Cloud Drive. 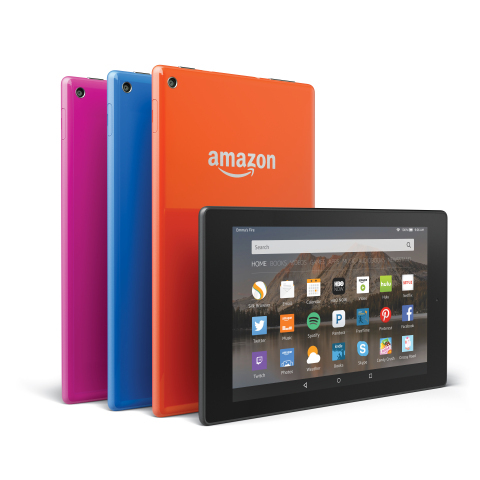 Eligible customers can get a free 30-day trial of Amazon Prime when they purchase a Fire HD tablet. Fire HD 8 is available for pre-order beginning today with 8GB or 16GB of memory starting at $149.99 at www.amazon.com/FireHD8 and comes in four fun color options: black, magenta, blue, and tangerine. Fire HD 8 starts shipping September 30. Fire HD 10 is also available for pre-order beginning today with 16GB or 32GB of memory starting at $229.99 at www.amazon.com/FireHD10. It is available in two color options: black starts shipping September 30, and white starts shipping in the coming weeks. Amazon also today announced the all-new Fire tablet, Fire Kids Edition, and a new Amazon Fire TV. To read the press release about the all-new Fire visit www.amazon.com/fire-pr; to read about the new Fire Kids Edition, visit www.amazon.com/kids-edition-pr; to read about the all-new Amazon Fire TV, visit www.amazon.com/fire-tv-pr.